Ride With The Knights Of SCUF! Do you hear it? The distant clatter of swords unsheathing: the thunderclap of thousands of hooves beating into the ground? By the time you hear it, it will already be too late: The Knights of SCUF have arrived! Embellished with the image of medieval crusaders in a dual-color scheme of silver and blue, the Knights of SCUF represents another addition to the already impressive Designer Collection. Fully customizable, this new Infinity Series controller is available for Playstation 4, and comes equipped with the patented innovations that make SCUF the choice of 90% of all console pro gamers. Sharpen your blade, mount your steed, and charge into battle! Some moments in gaming require you to be alert, coiled, and ready to strike at any time. Scuf Gaming prides itself on providing the level of precision and innovation that every player needs to make every movement count: to make every shot of yours worth ten of theirs. 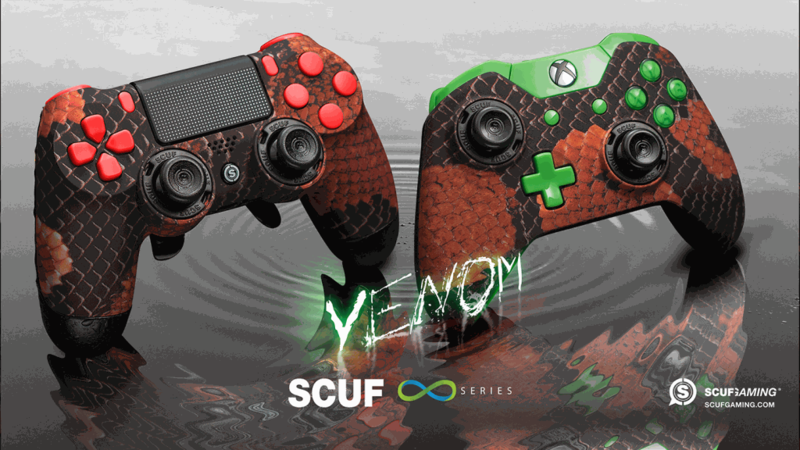 To celebrate that proud tradition, SCUF has released the all-new Venom Infinity Series. Available for both PS4 and Xbox One, the SCUF Venom features the classic design of snake skin with all the supple comfort the world has come to expect from a SCUF. This new addition to the Designer Collection is fully customizable and contains all the patented technology that keeps Scuf Gaming in the hands of 90% of all Pro Gamers worldwide. Get your handcrafted SCUF Venom for the Playstation 4 and Xbox One today! Scuf Gaming is proud of the infinite number of design and customization options that we offer the world of gaming. From the faraway world of science fiction to the excitement of eSports, there is no limit to the style and functionality that a SCUF controller can offer. Each of our Infinity Series controllers has been grouped into the category that represents it the best, from the smooth luxury of the Carbon Fiber Collection to the trendy prints of the Designer Collection. 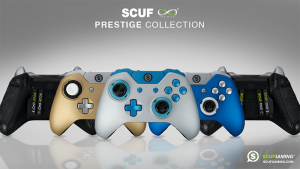 No matter which look or style you love, there is a SCUF Collection that is perfect for you. Each Collection is available for PS4 and XB1, and every design comes fully loaded with the patented technology that makes Scuf Gaming the number one choice among Pro Gamers. With so many looks to choose from, TeamSCUF is certain that you’ll find the perfect controller for you. Scuf Gaming is proud to announce its support of Breast Cancer Awareness Month with the introduction of our first Controller of the Month: the SCUF Pink Ribbon. Emblazoned with a shower of pink in a soft touch finish, the Pink Ribbon stands as a proud representative of breast cancer survivors and those we’ve lost along the way. But don’t let the delicate exterior fool you: each of these handcrafted controllers comes equipped with the same premium technology that has kept SCUF in hands of 90% of Pro Players for years. Keeping with the theme of Breast Cancer Awareness Month, a portion of every Pink Ribbon sold will go toward Breast Cancer Research and Awareness. 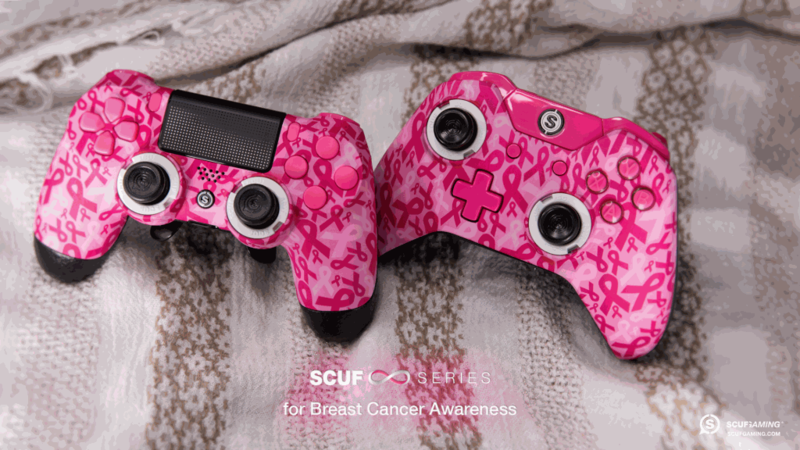 With this inaugural Controller of the Month, Scuf Gaming hopes to offer a tribute to survivors all over the world. This limited edition SCUF Infinity Series controller is available for Xbox One and PS4. Whether it’s a gift for yourself or someone you know, pick one up before they’re gone! 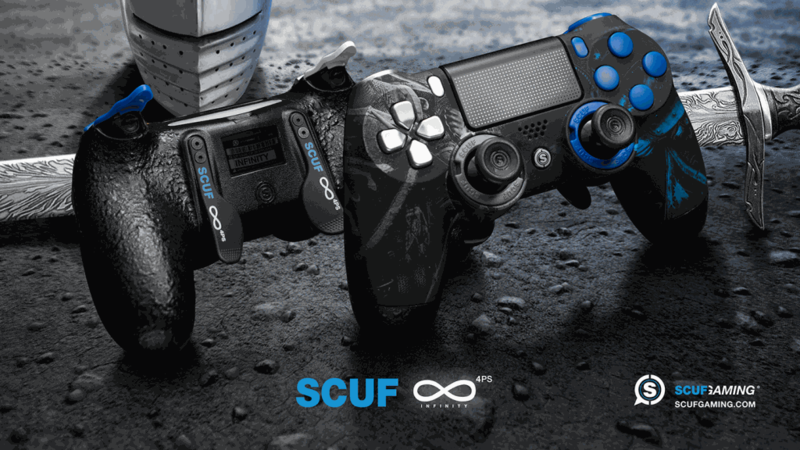 Introducing the Crimsix SCUF Infinity Series! In a world full of specialists, the professional who can have it all is rare indeed. Having established an amazing reputation for himself in the world of Halo, Ian “Crimsix” Porter shook the Call of Duty circuit when he decided that he’d like to be a champion there as well. It was a move that took eSports off guard, and created another legend in the sport. With record shattering wins in two of the most heavily-played competitive eSports titles in the world and a reputation to match, Ian “Crimsix” Porter is a battle-hardened dynasty unto himself. And SCUF believes that he deserves a controller to match. 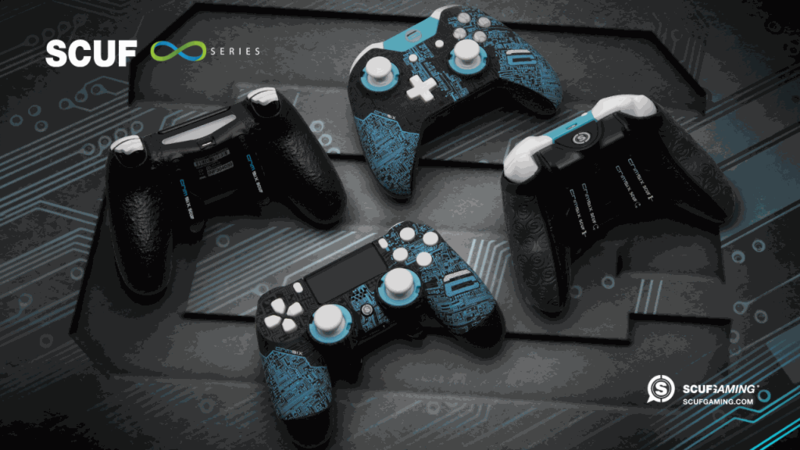 It’s our greatest pleasure to introduce you to the Crimsix SCUF Infinity series. With a shell spider webbed in an electric blue circuit design, this untamed beauty will fill you with the feeling of a methodical, calculating edge. The Crimsix SCUF Infinity is also kitted out in the same cutting-edge technology that has put SCUF in the hands of professional gamers the world over, remind you that a cyborg outside can conceal the passionate spirit of a warrior that beats deep inside. Because Crimsix’s amazing track record proves to us that true winning isn’t about stats or limits. It’s about looking losing odds in the face and scooping victory from the jaws of defeat over and over and over. Because if you gaze too long at the numbers, you become one of them. 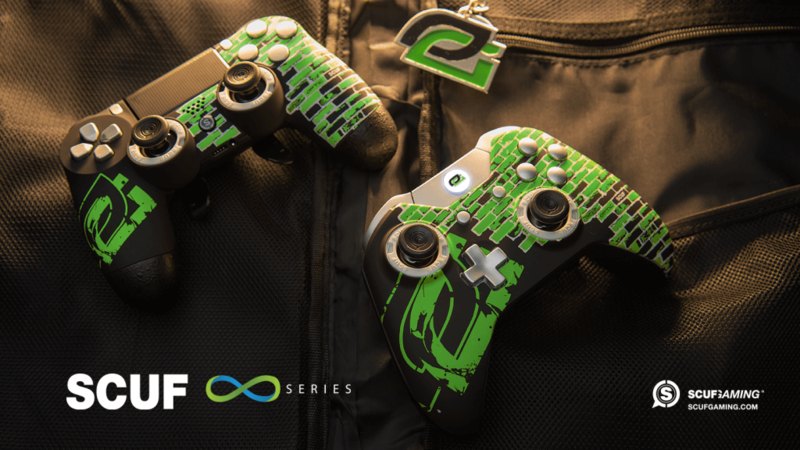 Click here to order a Crimsix SCUF Infinity1, and here to order a Crimsix SCUF 4PS! And don’t forget to visit Crimsix on Twitter and Instagram! In the history of competitive gaming, there are teams and there are legends. Scuf Gaming is thrilled to announce their latest design: the redesigned OpTic GreenWall SCUF Infinity Series controllers! These custom PS4 and Xbox controllers feature the iconography of OpTic Gaming in an electrifying new design. In addition to the paddles, hair triggers, and top grade thumbsticks that make a SCUF a SCUF, the new OpTic GreenWall SCUF Infinity Series controllers are awash in graffiti sprays of white, black, and OpTic Gaming green. This new custom controller not only shows support for your favorite team: it also sends a message. To start building a new SCUF OpTic GreenWall for your Xbox One, click here. To take the Wall to the Playstation 4, click here. “The Awakening”, the first DLC Pack for Black Ops 3, has arrived for Playstation 4 users. A total of four new Multiplayer Maps, the start of the Black Ops 3 “Zombies Experience” Der Eisendrache, and many bug fixes and balancing will be sure to give your SCUF Controller a workout this week. Gauntlet – highlighting Treyarch’s classic “three-lane map structure”, with very diverse and impressive visuals, allows players to travel through dense jungle, a frozen arctic area, and an urban city in the same map. Splash – an abandoned water park that offers plenty of fun combat opportunities including skirmishes down waterslides, a pirate ship, and a lazy river. This map definitely highlights many underwater combat opportunities. Rise – Features classic Call of Duty style combat with plenty of areas to employ the new core movement system. Arguably the map best designed for competitive play from “Awakening”, Rise heralds back to the classic cover-based Call of Duty. Skyjacked – A reimagined version of one of our personal favorite Call of Duty Black Ops 2 multiplayer maps, Hijacked. This map includes many new areas to explore thanks to the core movement system and provides a fresh take on a classic map. All four maps will surely provide fans of Black Ops 3 with exciting new opportunities and strategies to develop, and we’re sure to see the impact the balance changes make for the Pro Teams in the Call of Duty World League. Whether you’re a pro or a causal fan, make sure you have your SCUF Controller ready to go. SCUF thumbsticks and Paddle Control System make movement around the new maps a breeze and can provide that edge during every firefight. 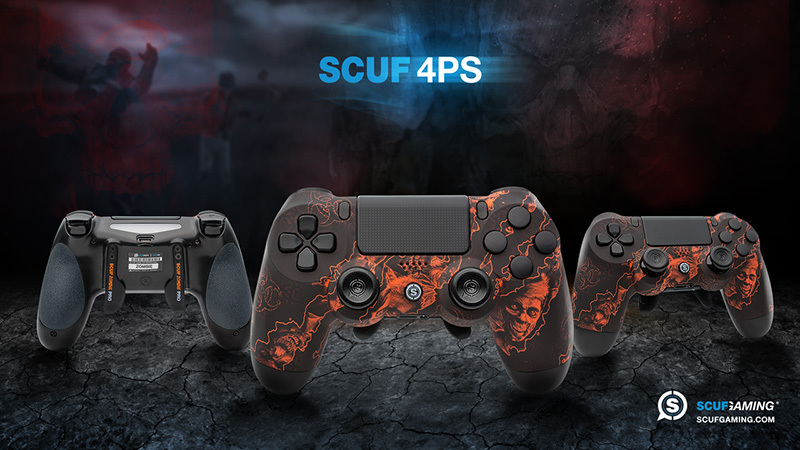 The core concept of any Call of Duty Zombies mode is survival, and nothing will help you survive the hordes of the undead like a SCUF Controller. For Zombies we cannot recommend the Electro Magnetic Remapping (EMR) feature enough; having the ability to change your back paddles on the fly is essential to a high-pressure team based mode like Zombies. Be sure to select this feature if you are a Zombie mode fan! Click HERE to start customizing your own SCUF 4PS Controller now. We’ll see you on the battlefields in “Awakening”. The moment Call of Duty fans have been waiting for is finally here – Call of Duty: Advanced Warfare has finally arrived! Advanced Warfare (AW) brings numerous changes that would be expected of a new game, new guns, maps, equipment, etc., but it also brings one major change that no other Call of Duty has featured, “Verticality”. “Verticality” brings AW to an entirely new level, literally. The new Exo-Suit allows players to move faster, deploy shield, cloak, and more in order to reach new heights, perform new maneuvers, and play Call of Duty like never before. To begin, we still like the “traditional” paddle configuration we used for all Call of Duty games; left paddle A and right paddle B for Xbox – left paddle X and right paddle O for Playstation. This configuration will give you maximum coverage of your movement both on and off the ground, and allow you to run circles around your opponents. The paddles in this configuration help you take your Advanced Warfare game to the next level. Another configuration we like is left paddle A, right paddle X (X/Square for PS). With the new reload mechanic in AW (you’re able to double tap reload to discard the clip for a faster reload), we’ve found that being able to reload quickly is the key between life and death in a firefight. Ammo is extremely plentiful in the game, so we often choose to sacrifice a few rounds in order to guarantee survival, or some crucial kills. Finally, for you 4 paddle users, the configuration is based entirely on how you want to play. For the run and gun types, AYXB, or AYBX allow you to gain momentum and keep it as you tear through the battlefield. If you’re a Sniper or Trickshotter you may want to try ABXY for the quick weapon swaps while keeping the mobility buttons, A and B, close together. Ultimately, the choice comes down to you as a gamer as to how to configure your custom SCUF Controller for Advanced Warfare. If you’re still unsure of what you’ll like best, you’re in luck because of one controller option, the EMR. Configure a custom SCUF Controller with the EMR (Electromagnetic Remapping) and you can swap paddle configurations to whatever you want, whenever you want. Feel like playing an Assault Rifle one map but with a Sniper the next? Simply use your SCUF Mag Key, swap your paddle configurations, and you’re good to go. The EMR has been essential to our game in AW so far, and we highly recommend it for gamers of all levels. Ready to take your game to new heights? Click HERE to SCUF Up your own Advanced Warfare Controller now! Call of Duty: Advanced Warfare is Copyright&copy;2014 Activision Publishing, Inc.
Destiny is still in full force as millions of gamers across the world continue to delve deeper in to the game. With Bungie constantly updating, patching, and releasing new content, Destiny is poised to stick around for a long time. 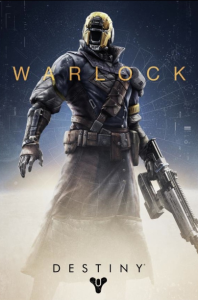 Next up is the Warlock, which excels at ranged combat, whether in the Voidwalker or Sunsinger subclass. Since our initial review of Destiny, we have taken more time to experience the Warlock overall; both sub-classes, its playstyle, etc. We still recommend, for both sub-classes, to have your far left paddle on the SCUF Controller, be the A button; mobility is key in Destiny overall and being able to jump, glide, and aim is crucial. 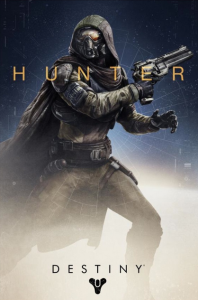 The far right paddle we would put as X if you are playing an upclose Sunsinger, for those quick reloads; for a more ranged focused Warlock we would put the far right as Y. The middle two paddles, for those of you using the four paddle design, are entirely at your discretion, but we definitely recommend those left and right paddle configurations above. 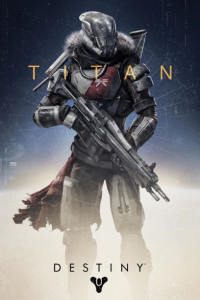 Our final class spotlight for Destiny features the Titan; a character who can choose to literally jump in to the fray to cause devastating damage, or to protect allies. Titans are most comfortable on the front lines of the battle, especially those playing the Striker subclass. Their Fist of Havoc Super Ability decimates anything it comes in to contact with, but will put them face to face with enemies outside the blast radius. Defender Titans are the same way, able to rush in to battle with their Ward of Dawn Super Ability that both protects and buffs yourself and allies. Due to that playstyle, we recommend using an A/X, or ABYX, paddle configuration for the Titan in either subclass. Being able to manuever correctly both in and out of danger and keep ammo in your guns is crucial, and mapping those functions to the paddles makes it possible to do so while on the move and aiming down sights. The Defender subclass of the Titan is very versatile. Being able to put a shield up to stay alive is great. Best class in the game imo, strong overall with versatile options and a deadly supercharge in the Fist of havoc! Have more to say about Destiny? Check out our Facebook and Twitter pages to join in the discussion! Be sure to pick up your own Custom Scuf Controller for Xbox One HERE or PS4 HERE and join in the fight! A new era has arrived for PlayStation 4 fans now that Scuf Gaming has introduced its clever functions to the improved PS4 controller. Scuf Gaming has officially launched the SCUF 4PS enabling elite gamers to utilize more of their hand in a comfortable, safe and ergonomic way. The SCUF 4PS is feature rich with several patented features, including two “SCUF HOOK” back paddles, a fully redesigned back and built-in high-grade SCUF Pro-Grip handles, which are normally an upgrade on SCUF controllers. The two back paddles come standard with A&B configuration but can be mapped according to your preference as an upgrade using the EMR (Electro Magnetic Remapping) Mag Key – (the EMR feature will be released at a later date.) For gamers unfamiliar with SCUF, these paddles mimic the allocated face buttons so you can keep your thumbs on the thumbsticks, while using the back-paddles with your middle fingers to perform more advanced moves. Customers also have the option to choose their favorite SCUF Precision Thumbsticks in domed or concave, which come in three different lengths (regular, medium, long) and various color options. Sports and fighting game fanatics will be thrilled to try the new SCUF CONTROL DISC, which is fully removable and offers extra control and accuracy for the d-pad! Gamers are winning with the tactical edge that SCUF provides where over 85% of Professional Gamers in Console use SCUF for shooters. Prices for the SCUF 4PS start at $119.95 (please NOTE this includes the PRO GRIP) and controllers begin shipping in 4-6 weeks. SCUF is currently offering fourteen (14) unique front shell designs for the launch and will be adding new styles over the next few months. To pre-order, please visit www.scufgaming.com. Scuf Gaming controllers are endorsed by Major League Gaming and trusted by over 85% of Pro-Gamers. SCUF is leading the field in the professional gaming market. Scuf Gaming is the manufacturer, wholesaler, retailer, and restorer of custom video game equipment and accessories. A company focused on providing “tactical gear for elite gamers,” SCUF entered the market three years ago with the SCUF controller. Scuf Gaming has 4 patents granted and another 25 have been applied for offering features such as back paddles, adjustable hair triggers, trigger stops, military grade SCUF grip and various thumbstick lengths in both domed and concave styles. SCUF controllers are legally approved for use at most major competitions to include MLG, EGL, WGL, Gfinity, Reflex, UMG, ESL, etc. Scuf Gaming also sells a variety of accessories and apparel specifically designed for Elite Gamers. Visit www.ScufGaming.com for more information. Editorial and product photos available upon request.